Anchorage Fur Rondy started February 25 and runs for nine more days. What an opportunity to enjoy Alaska’s Winter! 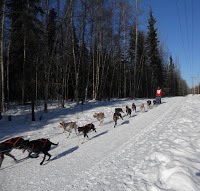 The World Championship Sled Dog Races go through our neighborhood on Chester Creek trail. Neighbors on Wesleyan Drive line the trail and cheer on the mushers. 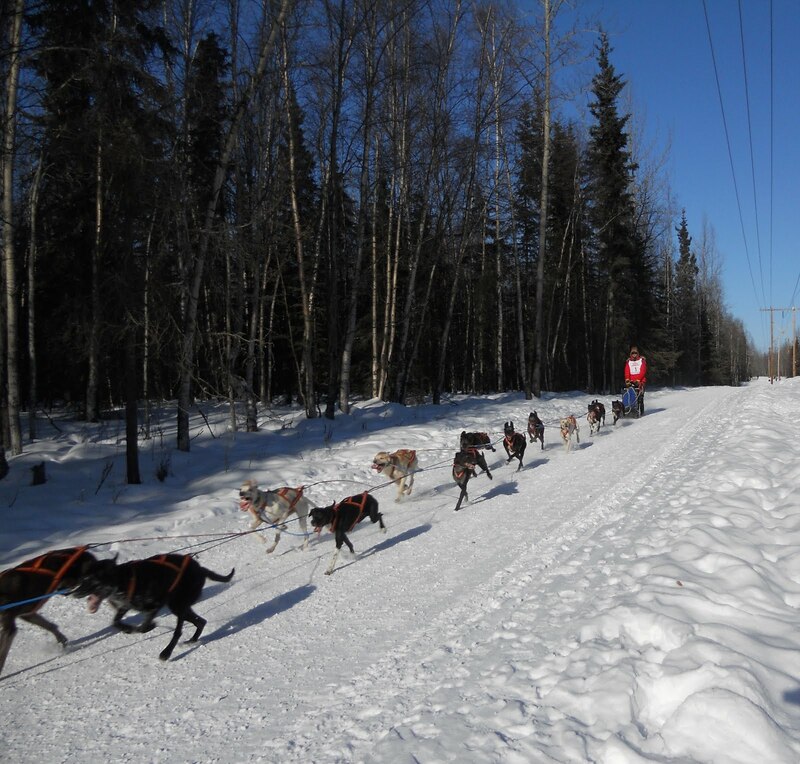 Several years ago one of Camai Bed & Breakfast’s guest took excellent pictures of sled dog racers as they were on this trail. This picture is of Arleigh Reynolds and his team. He is from Salcha which is about thirty miles south of Fairbanks on the Richardson Highway. For today’s second heat mushers started in reverse order of yesterday’s finish. Arliegh and his dogs finished first in Friday’s heat so he started last today. The classic blanket toss will be February 25 from 4-7PM downtown at the Carnival. The blanket toss is sponsored by Cook Inlet Region Inc. (CIRI). There will be more of this event on March 4, 5 and 6. Times for the blanket toss are posted on the Fur Rondy website. February 27 will be a good day to view the ice sculptures in the Ship Creek Area near the Alaska Rail Road Depot. Judging is Sunday. Dress warmly. It was sunny and cold with wind today. If you want to go to the outhouse race you will have to come to 2012 Fur Rondy. This race was today at 4PM. The outhouse race is sponsored by UAA to help send students to New Orleans to help Habitat for Humanity. On March 5 my husband Craig will be running with many other humans as well as reindeer. The event is at 4PM. I am expected to get good pictures. Finally don’t miss seeing the Fur Rondy Melodrama. This years is titled “The Merry Monsters of Matsylvania:” A Monster Melodrama. Tickets can be purchased at Center-Tix website. It is time to get out and enjoy the Anchorage winter events at Fur Rondy.